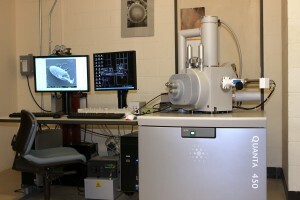 Description: The SEM is used to examine surface features and to collect compositional information of objects and materials at a resolution of 3-10 nm. The FEI Quanta 450 at Smith College is equipped with a secondary electron detector (SE), a backscatter electron detector (BSE), and an EDAX Energy Dispersive Spectroscopy detector (EDS). Easy-to-use FEI software controls the microscope and allows for easy data acquisition. TEAM software is available to acquire and analyze EDS data. Training includes a lecture, a demonstration, and hands-on microscope instruction.